NiCK'S SANCTUARY: Doctor Who: Matrimonial Bliss! Tonight's episode of Doctor Who was truly magnificent and was yet another timely reminder to the Whoniverse's fiercest critics, that the show is alive and kicking. Penned by Neil Gaiman and titled "The Doctor's Wife", the story focused on the intimate relationship between the Doctor and his "wife". It's a series highlight and features a solid story and some top drawer acting from Matt Smith and Suranne Jones. The Doctor's Wife - a solid episode steeped in Who lore and rich in emotion. As I'm sure you gathered before the show aired, the titular character was/is in fact the TARDIS. The master stroke that Neil Gaiman played was to hold a mirror up to the anthropomorphic relationship between The Doctor and his home/mode of transport. Many times we have heard The Doctor vocalise his attachment to the TARDIS, many more times have we seen him demonstrate it... on this occasion however, the TARDIS finally gets an opportunity to reciprocate and express its own affection for The Doctor. The soul of the TARDIS is captured by a malevolent entity and lured into a "bubble" on the edge of the universe. There in the darkness, a being has quietly been luring Time Lords to their destruction... feeding off their power and cannibalising their body parts along with other aliens to sustain its servants. The Doctor arrives on this barren junkyard asteroid in the hopes of finding some good Time Lords who may have escaped the Time War and who can forgive him for his actions. 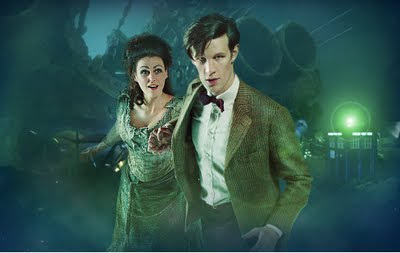 It soon turns out to be a ruse however and the Doctor is trapped on the rock with his TARDIS personified in the form of Idris (played by Suranne Jones), as the malevolent alien entity known as "House" hurtles off towards our universe in search of more "food" in the physical TARDIS, with Amy and Rory trapped inside... subjected to it's evil tricks. Back on the asteroid we are treated to some wonderful interaction between The Doctor and the TARDIS as they desperately try to cobble together a working makeshift TARDIS from the remains of all the other TARDIS hulks that have crashed on the asteroid. Eventually they make it back to the real TARDIS interior in time for a final conflict. When all seems lost and Idris' body dies, the TARDIS' soul is released back into the console and reclaims her rightful home from the "House entity"... purging him. "The only water in the forest is the River"
This isn't the first time Neil Gaiman has used this dramatic tool. He did something very similar in his Babylon 5 episode "The Day of the Dead". Two things struck me with regard to this statement. Firstly that River's eventual fate was to be downloaded into the memory of the library planet in the episode "Forest of the Dead", I think the Doctor may very well be travelling there in the future to rescue River's essence (because both river and forest are referenced). Secondly the fact that there is only one kind of water present... and of course Amy also shares a water related surname. Does this mean that Amy will not be with the Doctor in the future... or that perhaps that there will be an impostor of Amy travelling with the Doctor at some point? The episode succeeds as a whole because you really believe in the relationship between the Doctor and the TARDIS, so much so that in her "death" scene... I found myself welling up along with Matt Smith. Tardis: Doctor? Are you there? It’s so very dark in here. Tardis: I’ve been looking for a word. A big, complicated word, but so sad. I’ve found it now. Tardis: It’s sad when it’s over. I’ll always be here. But this is when we talked and now even that has to come to an end. There’s something I didn’t get to say to you. Tardis: No, I just wanted to say … hello. Hello, Doctor. It’s so very, very nice to meet you. Doctor: Please! I don’t want you to. Please. That scene really did have me weeping. Life is fragile... and the life we live in this world is temporary and all too brief. The knowledge that it all must come to an end is heart wrenchingly sad... most especially for those left behind. We should remember that although we eventually say goodbye to the people we have known and loved... that much more importantly we had the opportunity, the honour and the joy of saying hello to them in the first place and sharing a part of their journey too. As a Christian I believe that like the TARDIS, our loved ones may live on (by the grace of God). Although they are in a place where we can't commune with them... every so often the universe gives us a gentle reminder of who they were in order to reassure us of where they are. The other thing that struck me in this episode is how everything that is truly important to us in life, requires a relationship. If we merely like or appreciate something... it is a one way thing and worthless. Friendships, partnerships, relationships, marriages, families, schools and even belief systems require a bond to work. Even faith hinges on it. If salvation was just about us expressing our belief or even our love for God, it would be of little value. The Doctor believed that he had chosen the TARDIS, yet it is now the TARDIS who tells him that as much as he chose her, she chose him. She wanted to go off on a journey exploring the universe and he was the only one mad enough or willing enough to do it... the only one with the same desire to be free. Ultimately, that is what I think has to happen in a journey of faith. We may start out thinking it's a one way thing, a series of devotional acts towards God... but sooner or later in life we have an encounter with the God we are worshipping and he becomes real to us in a new way. When that day comes it changes everything. We learn that inasmuch as we think we have chosen God... he in fact has chosen us for himself too. When that day comes... it changes everything. We, like the Doctor, may protest that we are not always taken where we want to go; God, like the TARDIS, gently reminds us that he always takes us where we most need to be. Just recently I had a personal experience that reminded me of this very thing. At the end of the episode, The Doctor was deeply saddened that he couldn't communicate with the TARDIS in the same way any more... but is reassured when the controls start flipping and switching of their own volition. I am thankful that in my walk with God, that I don't need that kind of reassurance... you see God doesn't stop talking. True... sometimes he grows quiet... but it isn't because he is unable to talk to us, rather it is because we either need to rediscover our hunger for him... or because we are being encouraged to grow in faith in a hard but necessary way. Who is in control on your journey through life? Is your faith or your life a one way thing? May you be blessed as you seek an answer to those questions. Hiya, wow - thanks for adding me to your blog roll. Sorry to be a pain but I have moved my blog has moved - it is now at revdlesley.net - would you be willing to change the link?